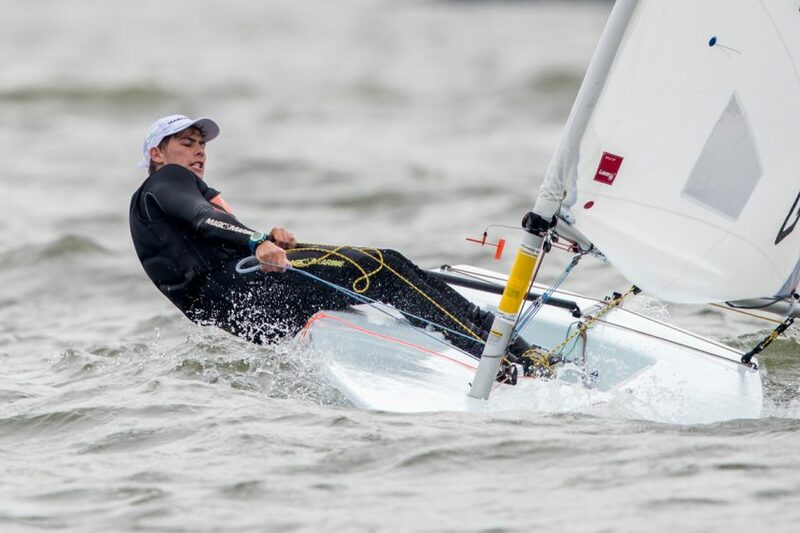 (Medemblik, Netherlands) – All six fleets completed two races today in the Final Series, which concludes the 2017 Laser Radial Youth World Championships in Holland. The wind was up from yesterday at a steady 15 knots with gusts of about 18-20 knots. The heavy breeze that launched new leaders to the front on Day 5, did the same today in the boys division. Dimitris Papadimitriou of Greece, who was not ranked in the top 10 heading in to the Final Series, began pulling himself to the front with a 3rd and 4th yesterday in gold fleet, and another incredible performance in today’s racing. With a 2nd place finish in the first race behind Spain’s Rafael De La Hoz Tuells, Papadimitriou moved into a tie for first place overall with Argentina’s Matias Dietrich heading in to the final race of the day. But in the final race, Dietrich finished with a 33rd as Papadimitriou sailed his best race of the Championship leading the fleet by a substantial distance to the finish. Dietrich dropped to a three-way tie for second place overall, with Nicholas Bezy from Hong Kong and New Zealand’s Josh Armit each with 59 points. In the girls division, the three leaders from yesterday’s racing found themselves battling again at the top. In the first race, USA’s Charlotte Rose sailed away from the fleet on the first downwind leg and never looked back on her way to the win. Rose entered the final series in 8th place overall, but her performance improved with the heavier winds of the finals series, making it clear that she likes the breeze. But the real battle in this race was for third place where regatta leader Hannah Anderssohn of Germany and Dolores Moreira Fraschini from Uruguay, who were separated by only four points, each had their eye on taking overall lead. In the end Anderssohn just snuck ahead of Fraschini at the finish to widen her overall lead to 5 points going into the last race. In the final girls race, Fraschini, needing to put five boats in between herself and Anderssohn, sailed a brilliant race and had to hope that Anderssohn would finish back in the fleet. But it was not to be as Anderssohn, Rose and Fraschini all showed excellent speed in the hiking conditions to separate ahead of the fleet in the fresh breeze. Fraschini hit the shifts perfectly upwind to sail to an easy win, followed by Rose and Anderssohn, who cruised to a conservative fourth place finish in the race, which was enough to close out the event and secure a prestigious Laser World Championship title for the young German. Fraschini finished second overall and Rose rounded out the podium in third place overall. 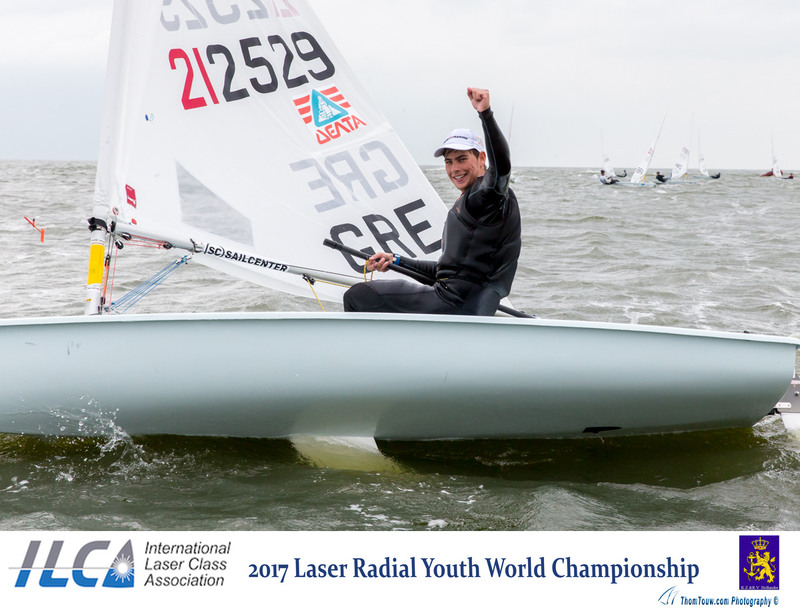 With that, Dimitris Papadimitriou and Hannah Anderssohn are named the 2017 Laser Radial Youth World Champions. 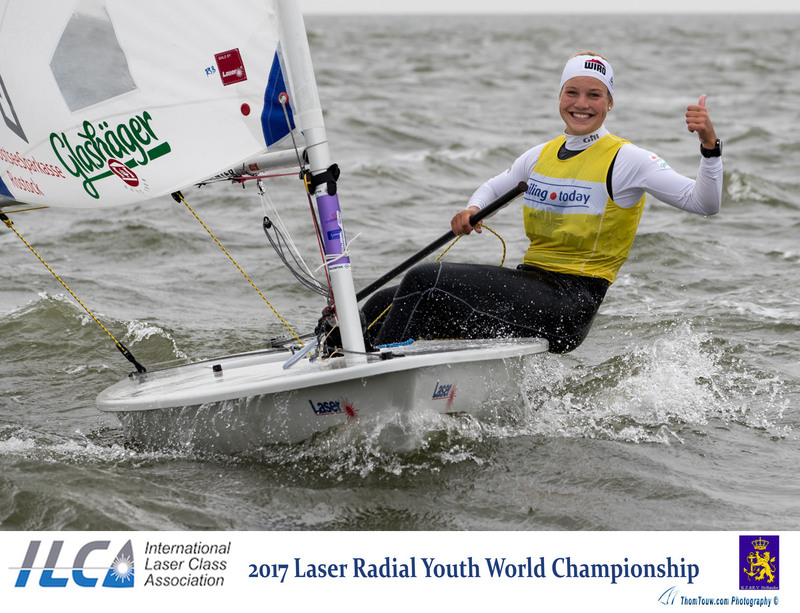 Racing in Medemblik continues next week as the Laser Radial Women and Men each vie for a world championship title.